Pasta salad is welcome at every table and Greek salads are a flavorful alternative to the common salad, so when you combine the two into a Greek pasta salad recipe, you know you're in for a real treat. Cook the orzo according to the package instructions. Once the orzo is al dente, rinse it cold water and place it in a bowl. Roughly chop the Kalamata olives. Remove any pits. 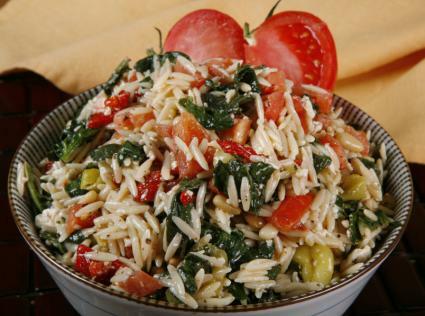 Mix the orzo, feta cheese, olives, garbonzo beans, cucumber, onion, peppers, and diced tomatoes together in the bowl. Set in your refrigerator while you mix the dressing. Toss the salad with the dressing and return to the refrigerator for an hour to chill. Garnish with the cherry tomatoes. You can add green onions or diced celery if you so desire. Mix together the red wine vinegar, lemon juice, garlic, and oregano. Slowly drizzle in the olive oil while whisking the mixture. Mix the dressing with the prepared Greek salad. Taste again for salt and pepper. Greek pasta salad can add fabulous flavor to any meal and add an exotic flair to the same old dinner. Try this salad with your favorite lamb recipes or serve it with falafel for a fun vegetarian feast.